Rhythm of the Reef Play Gym is rated 4.4 out of 5 by 9. 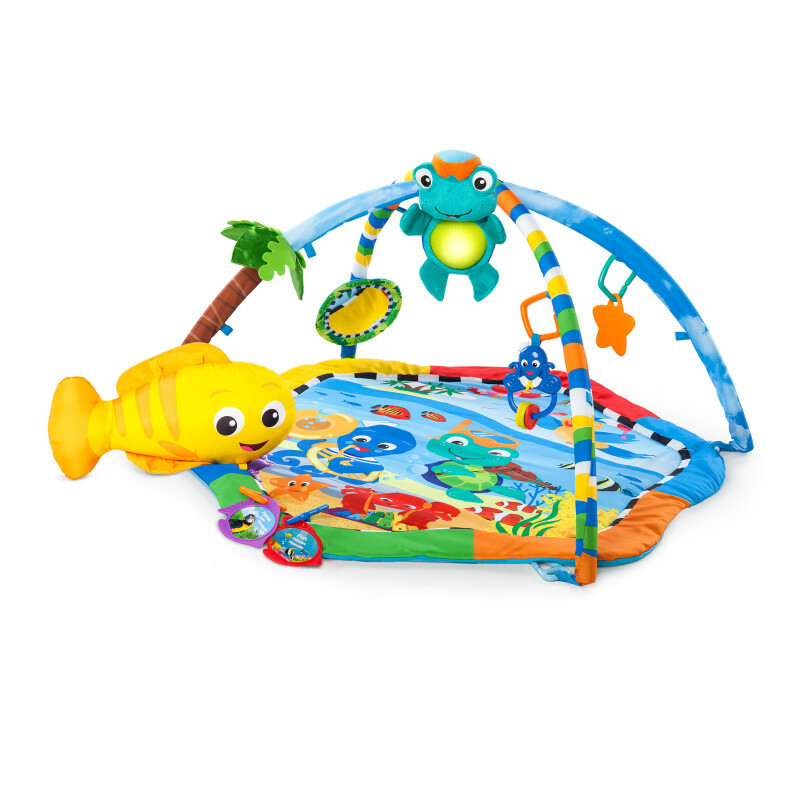 Great minds start little.™ Lights, melodies, and fun toys turn this play mat into baby's ultimate tropical play gym! With the Rhythm of the Reef Play Gym™ from Baby Einstein, little ones enjoy soft comfort, dancing lights, and classic melodies that entertain and encourage play. The two-mode electronic Baby Neptune toy features a soft light up belly and 20+ minutes of continuous lights and tunes that can be baby or parent activated. A 3D crinkle palm tree, baby-safe mirror, starfish toy, octopus bead chaser and flash cards with real-life imagery keep baby entertained. For tummy time, a plush fish-shaped prop pillow provides extra comfort for playtime. For added versatility, the Baby Neptune toy attaches to carriers and most cribs for lights and sounds on-the-go. Rated 1 out of 5 by BethAnn from Loop not sewn properly This was my 4 month old favorite until loop underneath for cross bar lost threading & fell on my baby. Rated 5 out of 5 by Bargainbrit from A colorful way to entertain your baby! I received this as a review item from the company and could not be more pleased. When my first son was born we owned the older version of this play gym and he loved it. The colors are bright, engaging, and the play gym has everything you need to entertain your baby. It makes play time on the floor with your baby fun. I personally believe a play gym like this one is a must have for any parent. It's easy to assemble and can be folded down to take to relatives homes during the holidays, to the park, etc. I am very excited to use this once my son is born and highly recommend it. With lights, sounds, and interactive toys what is there not to love? Rated 5 out of 5 by Jenniferh from Cute and fun We were given this wonderful playmat as a review item. All opinions are my own. I love this playmat, it's very colorful and intriguing to the eye. My son also loves this mat for tummy time. He hates being on his tummy but he grabs at the images on the mat and the toys laid out in front of him. He also enjoys the sounds. It's well made was easy to assemble and to store. Rated 5 out of 5 by PROUDMOMMYMELISSA from ABSOLUTLY LOVE AS IVE MENTIONED TO SO MANY PEOPLE THIS IS AMAZING. MY SON RECEIVED THIS AS A GIFT FROM THIS SITE FOR US TO REVIEW AND I ONLY HAVE AMAZING THINGS TO SAY ABOUT THIS GREAT OPPORTUNITY . WE RECEIVED THIS NICE SIZED BOX ON OUR DOOR STEP. MY 6 YEAR OLD EXCITEDLY OPENED IT AND PULLED OUT THIS VERY COLORFUL PLAY MAT . THE ASSEMBLY WAS ABSOLUTLEY OBVIOUS AND EASY THOUGH THE RINGS WERE A BIT HARD TO GET INTO THE LOOPS WHICH ONLY MAKES SENSE SO IT DOESNT EASILY DISASSEMBLE . I LAID MY 3 MONTH OLD DOWN ON IT HE WAS ABVIOUSLY SUPER EXCITED LEGS WERE KICKING HE WAS TRYING TO REACH FOR OBJECTS THEN HE SPOTTED HIMSELF IN THE MIRROR AND STARTED TALKING TO HIMSELF AND LAUGHING ITS AMAZING. I HIGHLY RECOMMEND THIS TO ALL PARENTS. I THEN LAID HIM ON HIS TUMMY HE WAS GOING AFTER THE TEETHERS LAUGHING THE MATT IS SQUISHY SOFT AND ITS SAFE FOR BABIES. EASY TO STORE AND TRAVEL WITH . ALL IN ALL FIVE STAR IS A MUST ON THIS. OBSOLUTLY LOVE THIS PRODUCT IT DOES START THIER LIL MOTOR SKILLS AGAIN I SAY A MUST HAVE. MY SON IS NOW 5 MONTHS OLD AND STILL LOVES THIS ITEM. HES NOW SPINING AROUND AND ROLLING OVER TO GET THE TOYS I LOVE TO SEE HIS SMILE AND PERSONALITY GROW WITH WITH THIS GYM. THE TURTLE I NOW HAVE ATTACKED TO HIS CAR SEAT HE LOVES TO GRAB AT IT AND PULL ITS ADORABLE. AGAIN I SAY I MUST HAVE!!! Rated 4 out of 5 by alijohns from Great Product and Awesome Value The Rhythm of the Reef Play Gym came to me free from the Kids II Company. It arrived in a huge box which got us excited immediately! The box was easy to open and take all the stuff out. Once I started to assemble to product I became confused with the instructions. All you really need to do is attach the poles to the mat. I had to redo the pole attachment and finally was able to get the mat to lay flat. The toys are zip-tied to the poles and those need to be cut off. I noticed there were re ally no attachments that would hook the fish to the poles for example. The fish had loops sewn in it and the bars had loops sewn in them. No Velcro, links, or ties to connect each other. The mat comes with a few plastic links that can be used to attach some of the items, but it doesn't seem like there are enough. I ended up using some loops from other toys to connect the other items to the mat and bars. The mat itself is small, and the bars that hang over it are pretty low. There is not a lot of height which allows the toys to hang and touch the mat. The colors and theme of this mat and toys is SUPER CUTE! The song/light turtle is super special and something my son loves. The giant fish pillow is adorable. The mirror is a nice size and has a pretty good clarity. There is a teether toy/rattle as well that my son loved. I noticed there are some fabric loops on the mat where the toys can be connected. All the toys and mat are really high quality and versatile. Moving the mat is easy too. It simply folds up flat so you can move it around the house. This is a great product, and I would recommend this to other moms. I felt the instructions could have been clearer, and there should be a better way to attach the toys to the bar or mat or more links provided to do so. The entire product is high quality. It has a variety of toys to play with which can be used many ways either with or without the mat. It is at a fair price point compared to other play mats at the store. Rated 5 out of 5 by Anonymous from Keeps baby entertained for hours! The Baby Einstein Rhythm of the Reef Play Gym is a fabulous activity center for babies ages birth and up. My son although not a newborn anymore LOVES this activity center. It is so much more than just a baby play mat on the floor. It is an interactive, sensory loaded, comfortable and multi-functional activity center! Personally I really like this Reef play Gym by Baby Einstein, because I found it to be more functional for a wider age range. It works great for a newborn baby. Baby can enjoy some tummy-time using the adorable soft fish shaped pillow or lay on their back and interact with the plush electronic Neptune toy which makes music and flashes lights. As baby becomes more of a sitter they can continue to sit under the soft bars over head and play with the toys dangling down or you can easily remove the bars and toys and baby can sit and play (or teeth) with the toys and Neptune toy). As a mom of 4 I would highly recommend this Baby Einstein Reef Gym and give it two thumbs up!! !